If there’s one thing that travel teaches us again and again, it’s that we should be prepared for anything. What happens when we’re not prepared? Well, that’s when we run into issues. One particularly terrible story involves a flight cancellation that stranded a family in a Missouri airport at the outset of hurricane Sandy. There’s nothing like facing the choice between remaining stranded for nearly a week and getting into a rental van, packed with six people and all of their luggage for a 24-hour drive back to New York. At least that’s what my family tells me about the ordeal. They booked a later trip home than I did and then had to make that drive when their flight was canceled. They still tell horror stories from their impromptu road trip. They were caught off-guard by the storm’s severity and by the time they realized, all flights in or out were canceled. 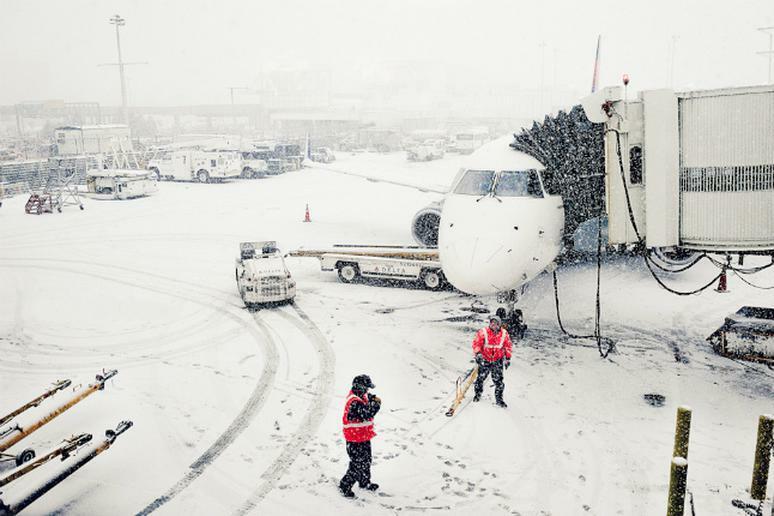 Keeping track of the weather could mean the difference between getting an earlier flight and spending an extra five days away from home, but that’s just one of the things you should know when it comes to canceled flights. When you run into airline issues, now you’ll know what to do. #1 Know your airline’s policy. How they deal with displaced passengers may or may not affect your choice to book with them, but you should know their rules either way. What they offer you will depend on the situation, specifically, was the delay or cancellation their fault or was it out of their hands? If the airline is responsible for the issue, you have a much better chance of being compensated. Take a look at this chart on major airline cancellation policies or go directly to your airline’s website. #2 Know your rights. There is still some semblance of government oversight on how airlines treat their passengers; you should know what you’re entitled to under the law. Back in the day Rule 240 protected passengers from issues within the airline’s control by stating that they had to get you to your destination—even if it meant booking you a flight with another airline. Today, many airlines have done away with the costly rule, but some have similar policies in place. There aren’t many laws protecting travelers anymore, but one that remains is that airlines are not legally allowed to overbook flights. If you are involuntarily bumped from your flight you are entitled to compensation. Read all of the details on here. #3 Sign up for alerts and monitor the weather and reschedule your flight ahead of time. When you’re among the first to know, you have a leg up on everyone else. If it’s two days out and you see a major impending storm, you can reschedule your flight. Airlines will often let travelers reschedule at no additional cost in attempts to minimize chaos when the weather causes problems. Sign up for alerts with your airline and download Apps like FlightStats to stay informed. Some airlines, like Delta, have a feature that allows you to rebook flights from their App. #4 Get to the customer service desk and get on the phone. When you find out at the terminal that you’re flight’s been canceled, head over to the customer service desk immediately, while dialing the customer service number. There will likely be a long wait for both, so it’s good to start waiting simultaneously. Similarly, reaching out on social media is an option when nothing else is working. Twitter has helped travelers connect with customer service in the past, but this shouldn’t be the only thing you’re doing. It’s also fairly common to get different responses from each of the channels—if you don’t like what you hear in-person, maybe the person on the phone can give you a better option. #5 Get what you can from the airline on the spot and deal with the rest later on. Airlines can offer discounted rates and vouchers for hotel rooms, meals and even transportation to and from the airport. See if you can get immediate assistance in the form of vouchers and discounts, and if you’re not happy with their solution, you can try to negotiate a better deal later on. Very few people write letters after the fact, but it’s a great way to see compensation from the airline, especially if you’re a loyal customer. Additionally, there are a few things that will help get you on your way as soon as possible. —If you are a card holder or rewards member with the airline you will be their priority. Second best is being a loyal customer. —If you are flexible with travel times and which airport you’re willing to fly into, it will be easier to get a flight. —If you carry on instead of checking your bags you won’t have to worry about lost baggage or last minute transfers. —And finally, as unfortunate as this is, the traveler that complains the most is likely the one that will be helped first. We don’t advise being obnoxious, but those who know how to complain (relentlessly) and who to complain to (the higher-ups) will get the best and most immediate assistance.